After breakfast, we will beging with a small tour around Casablanca to vist Hassan the second mosque before we head to Rabat and later to Fes. We explore most important cultural place in Fes, which is the oldest city in Morocco. We will visit Royal Palace, the Jewish quarter and also other cultural and historical sites. The tour includes visit of the Al Qaraouine University, the famous tanneries, and Mulay Idriss mausoleum. Today we stay overnight in local riad with dinner and breakfast. Our local city tour guide will take us through the narrow alleys of Fes to explore the most important cultural places. We will visit Royal Palace gate, the Jewish quarter and also other cultural and historical sites. The tour includes visit of the Al Qaraouine University, the famous tanneries, and Mulay Idriss mausoleum and more. Today we explore Merzouga desert. We will also visit village of Khamlia, famous for musicians originally from Sudan and Mali. We will have lunch with Berber family living in desert and later today we prepare for camel ride in Sahara desert, guided by experienced camel guide. We will watch desert sunset in Merzouga desert. Once we reach desert camp we will enjoy Berber dinner, drum music at campfire in Merzouga. We will sleep in tents in desert Merzouga. 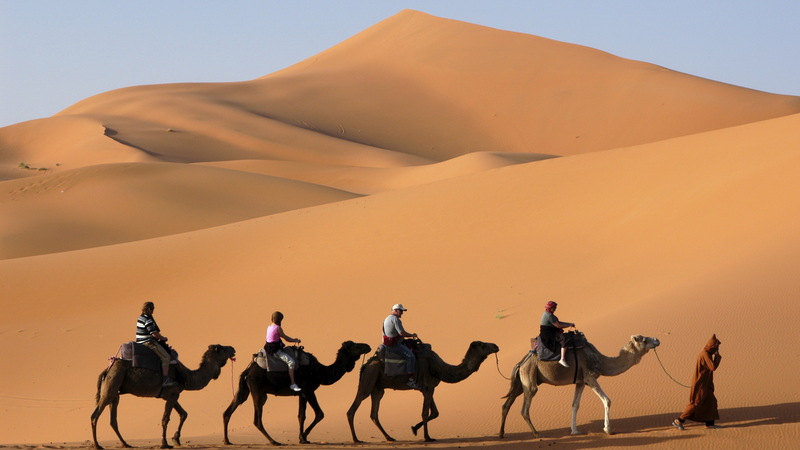 Our private Morocco tour continues today and we ride camels back from Merzouga desert camp to village. After breakfast we drive towards Rissani to visit local souk, then to Todra Gorges. Here we will walk in narrow canyon we experience hiking. Later we continue to Dades Gorges where we stay overnight in local hotel with dinner and breakfast. Today we continue our private Morocco tour to Ouarzazatte to visit local movie studio. Then we drive via the highest road pass in Morocco called Tizni Tichka and we arrive to Marrakech. That will be the end of our services.